Organic blackberry by North Pulaski Farms. Marshmallow by Kraft. I went to a local farmers’ market yesterday for the first time in I-don’t-know-when, other than a couple months ago when we had the Blogger Bake Sale at the Argenta Farmers’ Market. And I didn’t get to look around that day. We had just rolled in from a vacation to the Outer Banks of North Carolina. Although I cooked whenever possible, we still had eaten more than our share of road food. I recalled that the Bernice Garden Farmers’ Market runs until 2 p.m. on Sundays, offering a chance to load up on some cleansing fruits and veggies. Usually, this is my after-church crash-nap time. But, since I had just been sitting in a moving vehicle all day, I was daisy-fresh. Ish. It was my first time to the Bernice market. I saw some newcomers to the market scene (North Little Rock Community Farm, which I’ll write more about soon), as well as some familiar faces, including Kelly Carney, owner of the all-organic North Pulaski Farms. I came away from his booth with some special breed of cucumbers and a carton of the biggest, most amazing-looking blackberries I’d ever seen. Did I mention they were organic? Of course, the whole purpose of the trip was to make some healthy fare. 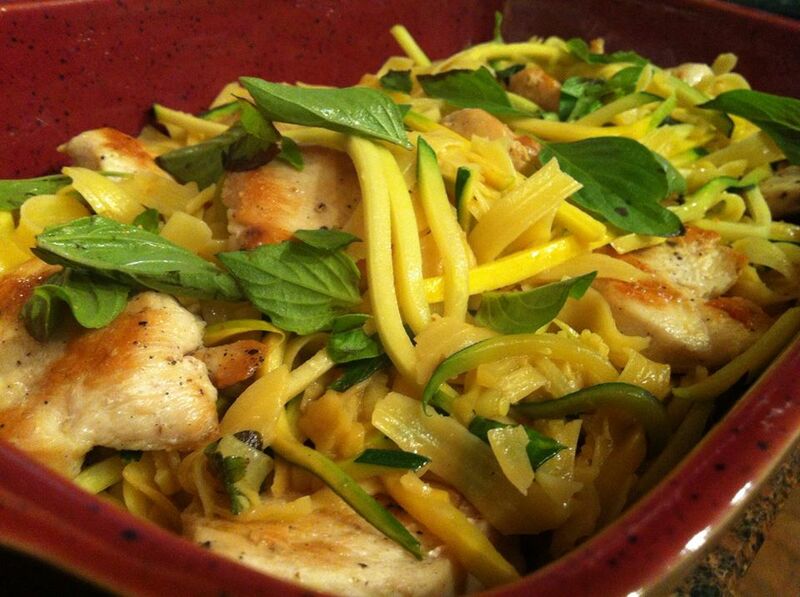 That would be on the menu all week, what with all the squash and zucchini and onions and such I had picked up. I unpacked the camping goodies from our trip while I snacked on the blackberries. Marshmallows. Toward cabinet. I fiddled with a marshmallow. I broke it open, kind of unrolling it from one end to the other so it would be long and thin. A muse descended and guided my hand, placing a ripe berry in the middle. Then the gas cooktop caught my eye. 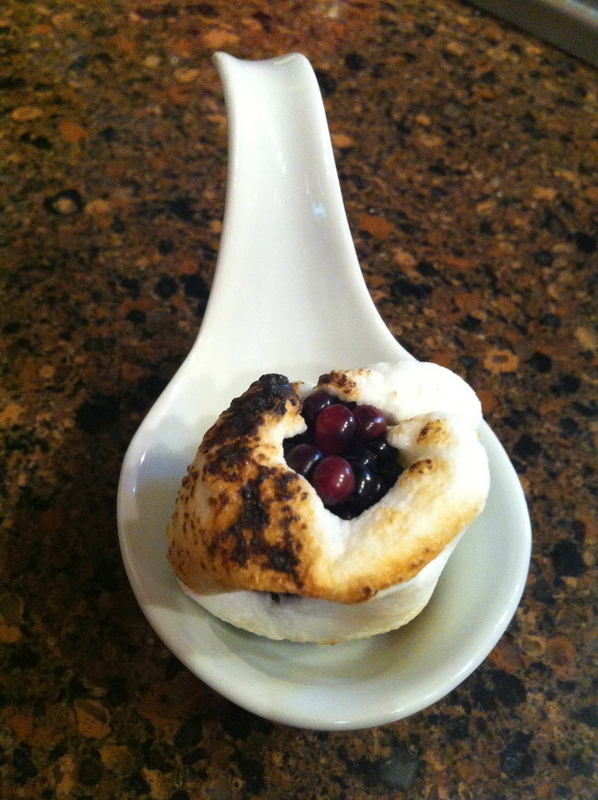 Soon, I had pierced another marshmallow-wrapped berry with a chopstick and was roasting it. A roasted marshmallow. With a berry inside. 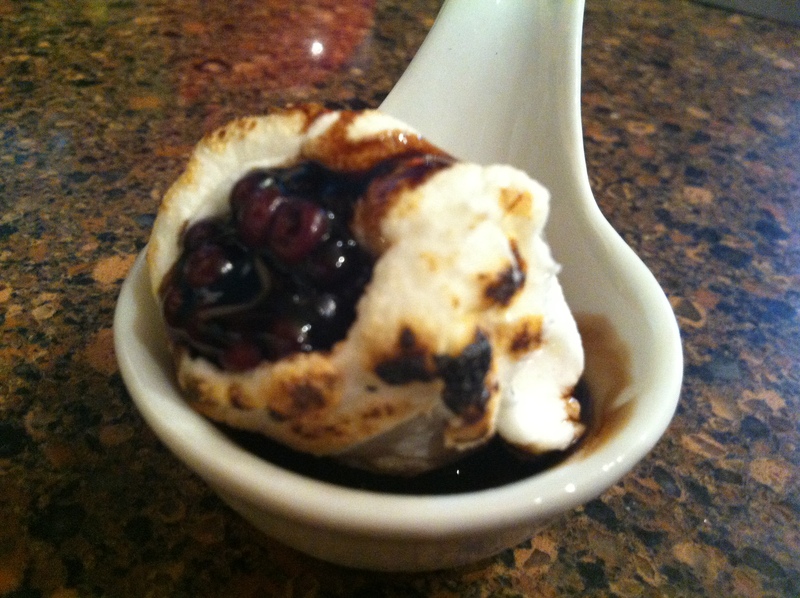 Roasted marshmallow blackberry with balsamic. Oh, how it wanted a mint leaf! Soon, my daughter caught on to the awesome and we roasted several. I drizzled a bit of balsamic on one, and that was over.the.top. It wanted a mint leaf, but alas, I had none. I’ve made a couple healthier things with my market finds today. But I had to share this. It’s just so ridiculous, it’s awesome. Amazeballs gluten free chicken pot pie, if I do say so myself. Learn to make your own at my class! I had a lot to do last night. Pinterest-y Valentines for the Kindergartener’s friends. A not-so-Pinterest-y Beyblade Valentine mailbox for same Kindergartener. Spray-painting elements for said box outside. Realizing that wasn’t going to work and going out for red plastic plates. Baths. Homework. All that momma stuff. 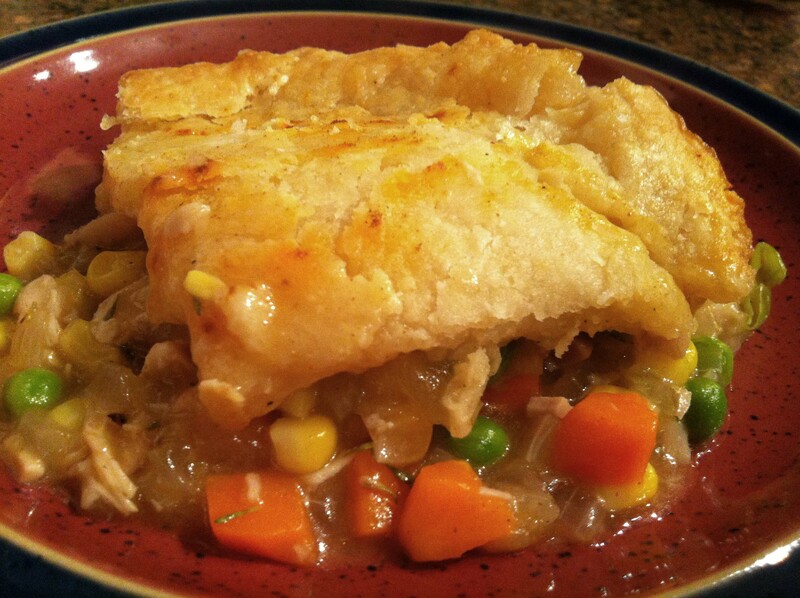 For some unknown reason, I decided it would be a dandy night to make chicken pot pie from scratch. Well, sorta from scratch; my mom brought a rotisserie chicken over at lunch, and the leftovers pretty much demanded to be pot pie. They told me so. It’s just as well, since I’m teaching a class next month at Pulaski Technical College’s Culinary Arts and Hospitality Management Institute on this very dish. Why not practice a few times? Yum. The whole pot pie. In class, we’ll probably make individual-sized ones. Equally delicious. Last night’s version used (gasp) frozen veggies, just because it’s what I had and I forgot to go to Kroger. Sue me. (In class, we’ll bust out our real knife skills on real-life veggies. Because you need the practice.) Well, I did dice a real onion and some garlic, so there’s that. The class is $75 for four hours of instruction and lots of tomfoolery. But productive tomfoolery. Let’s just say we’ll have fun. Sign up for this class by calling (501) 907-6670, ext. 3407 or emailing Emily Story, Director of Community Education at PTC. See you there! My glorious plate of too-few GF turkey potstickers. Most of the time, I don’t really mind being gluten-free. I’ve gotten used to GF bread (don’t eat much anyways). I’m better off skipping the cupcakes and such at the bakery anyways (with a notable exception). But there are two siren calls that still wail to me: doughnuts and Asian dumplings. Not much I can do about the doughnuts right now, but I saw a post recently on Brokea** Gourmet that rekindled my hankering for potstickers, the close cousin of traditional steamed dumplings. I’d found myself on the aforementioned site because I’m bootstrapping a new spinoff business, one that you’ll hear all about very soon. Things are going well, but the fancy food budget has been, well, constrained. The recipe fit right in, using small amounts of inexpensive ground pork or turkey and some other bits that I mostly happened to have around. I probably would have rather used pork, although I usually don’t eat much of the stuff, but my local Kroger didn’t have any ground pork on hand. I picked up the turkey instead, remembering that the recipe said it would be fine with the addition of an egg yolk for added moisture. It took me a while to find the rice paper, but when I did, I realized what a great deal it was. For a little over $2, I had like a bazillion wrappers for my little packets of Asian awesome. I couldn’t wait. I made the mistake of coming home to cook dinner right after a major shopping trip. Hungry. Panicked. Must. Have. Dumplings. NOOWWWW. In a move of total desperation, I put the husband on rice duty. Just cook some white rice, sauté the veggies and throw them together, I said. He looked at me like I was speaking Korean. “You did cook before we got married, right?” More blank stare. He ended up doing pretty well, despite charring the zucchini a bit — the daughter asked how I made it because it was so good. Heh. Meanwhile, I got after the cumbersome task of the dumplings. The filling was easy enough, if you’re comfy with your knife skills; just some mincing and a quick stir. The wrappers, however, were a little more tricky. In this recipe, you wet two large pieces of rice paper and stick them together, then cut smaller circles out of that using a cup or small bowl as a guide. A little cumbersome and time-consuming, but I got one sheet done, resulting in four small circles. Yay! 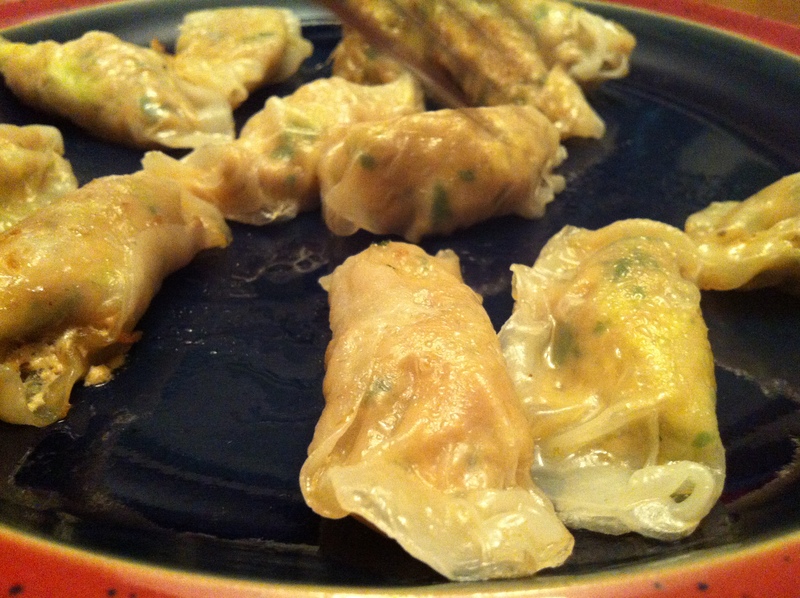 Oh wait…I want to make more than four dumplings. Fill those, struggle with sticky edges, smoosh closed however they’ll smoosh. Repeat. Cook those, and repeat again. Since you really can’t cook more than eight at a time anyways, the process was very staggered. After the second batch of eight, I was done. I could have eaten twenty more of them, but I was tired of it. And hungry. Darned shopping! Everything said, these were delicious. If I do it again (and I probably will), I’ll start early, when I’m NOT HUNGRY, and make a bazillion dumplings all at once. To do this, I’ll have to keep them on a non-stick surface, maybe a Silpat or wax paper, covered with a wet towel to keep the wet rice paper from drying out and getting crunchy. Doable. 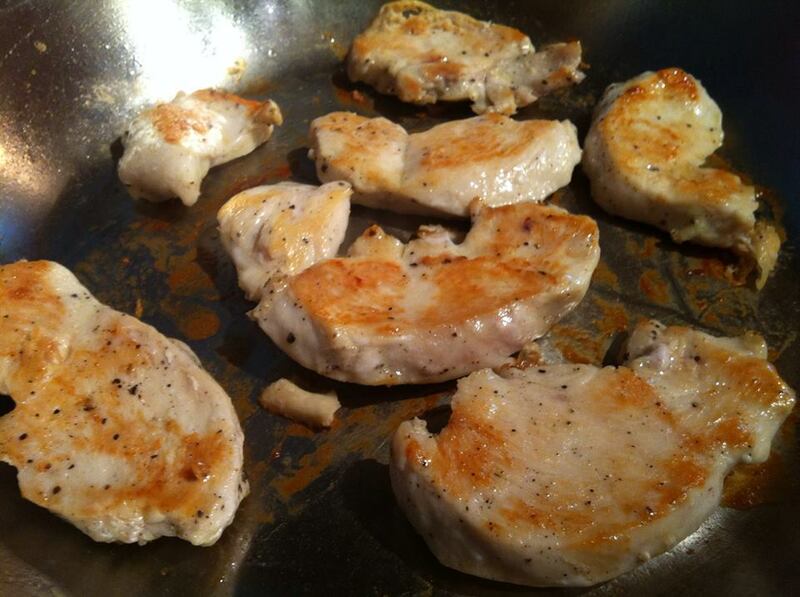 Also, I think I’ll fry them a bit more on each side before the steaming step. The linked recipe didn’t suggest this, but the rice paper did often taste a bit gummy on the side that didn’t meet the pan directly. A bit of oil and a little flip before steaming wouldn’t kill anyone. Now that this subject is broached, maybe I’ll try a more authentic pastry-style dumpling next time, like this one by Gluten Free on a Shoestring. Or, I’ll just make a bazillion of the rice paper ones. Either way, honey, you’re on rice and veggie duty. Fair warning. 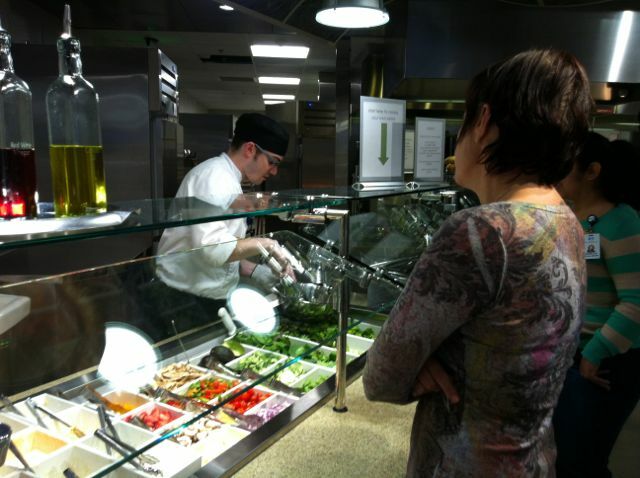 A chef tosses a customer’s salad to order at Green Leaf Grill. I don’t do a lot of restaurant reviews, but I had to share an experience from last week. In short, there’s a fairly new cafeteria, or fast-casual, or some kinda restaurant in the Arkansas Blue Cross Blue Shield building on 7th and Gaines in Little Rock, and it’s pretty amazing. I was there for a meeting with Chef Jason Knapp about an unrelated business project. If his name sounds familiar, it should; Knapp’s lofty résumé hails from the Governor’s Mansion to the culinary school and Big Rock Bistro at Pulaski Technical College, then Executive Chef of Aramark’s dining program at the University of Central Arkansas in Conway. 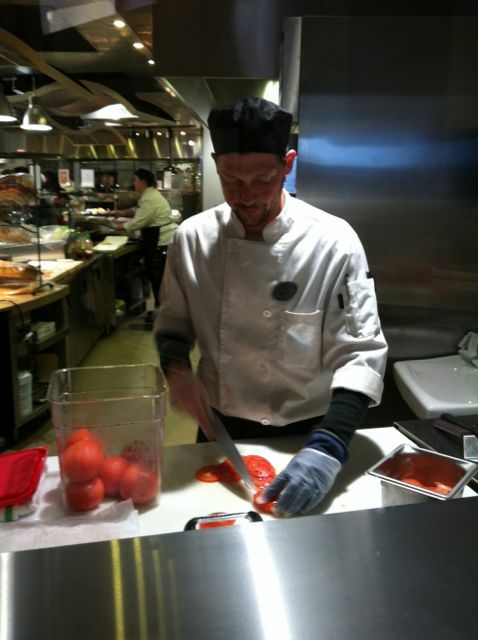 A chef slices tomatoes for the grill station. It was likely at his last two appointments that Knapp got a good sense of what cafeterias need: fast, quality food that can serve a mass of hungry folks when they all show up at the same time. (Note: Much of his work at UCA involved cooking for special functions and executive meetings, giving him the best of both worlds of this type of foodservice experience.) At his new venture in the BCBS building, managed by Compass Group USA, he was given the opportunity to take cafeteria-style efficiency a step further and implement his passions for fresh, scratch-made food, using local ingredients as much as possible. The spacious serving area has several large sections, including grill, deli, pizza, soups, entrees and a tossed-to-order salad bar. Just walking around looking at each station, one thing became immediately apparent: None of this stuff came from a box. There’s a swarm of young chefs buzzing around each station and in the open-to-view back kitchen, and each one of them has a hand in creating real food. Each freshly prepared item is pleasantly offered in French-style blue enameled cast iron, offering a bistro-meets-home feel. 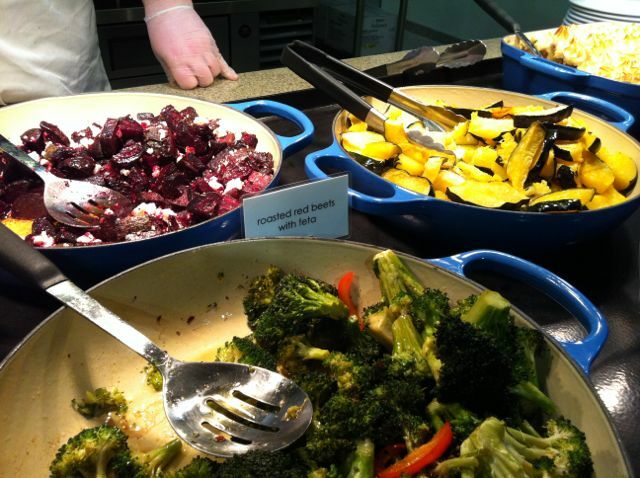 Fresh vegetable selections in the entree area. I asked the chef what I could eat, having to be gluten-free and all. Usually, in a cafeteria-style operation, I would get glazed looks because they often don’t even know what’s in the food. Knapp immediately rattled off at least three entrees that were safe. He knew every single ingredient because he planned them himself, on a menu that changes daily. The Shepherd’s Pie was calling my name, with its billowing, toasted peaks of mashed potatoes over fresh vegetables and tender, flavorful ground beef. The sides, however, were the show-stealer. I chose the beet salad with feta cheese and the roasted broccoli, both healthy and beautiful enough to not look it. My meal, with a drink (I chose the cucumber-infused water), came to about eight bucks. Not bad. That seems to be the idea at Green Leaf, healthy food that you’d crave even if it wasn’t. I ran into a friend who works at Blue Cross, and she said the company was moving in the direction of promoting health in all areas for their own employees, and the restaurant was just one part of that equation. Luckily, it’s open to the public, too. Check it out (weekly menu here) and you won’t think of cafeteria food the same way again. Breakfast grill hours 7:30 – 9:30 a.m. Lunch 10:45 a.m. – 2 p.m. This decadent sticky rice is simple to make and easy to substitute with holiday leftovers. I opened my fridge this morning, and there it sat, taunting me. Ugh, I’m so tired of you. I had a bagel (GF, of course) instead. But, before said ham is relegated to the freezer until I want it again, it’s going to have one more incarnation: New Year’s Blackeye Peas. It would have been even better with the bone, but my mom made the ham this year and kept that prize for herself. You’re likely in the same boat, a fridge full of bits and pieces that need to get used or frozen pretty darn soon. Go ahead and do that; don’t be wasteful! Bag up and freeze what you can’t deal with, and make a few fabulous New Year’s dishes with what you can. I have a couple ideas that might help. I discovered a quite lovely Christmas potluck dish a couple weeks ago when heading out to a party. 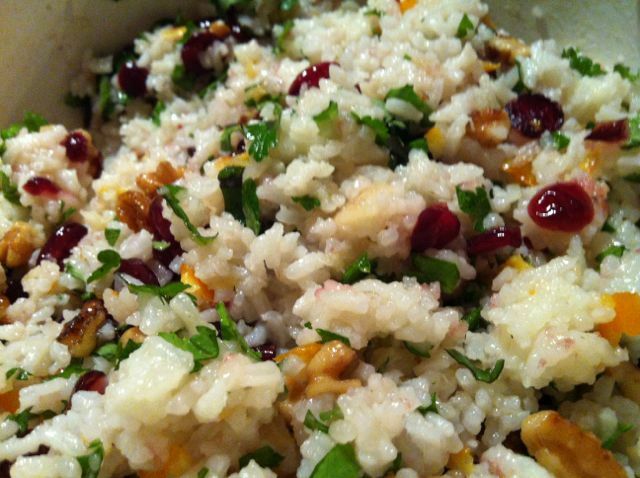 This rice dish features walnuts, dried cranberries, fresh parsley and basil, which were beautiful and delicious in a red-and-green sort of way. I added orange marmalade to the original recipe for color, flavor and a bit of sticky-rice texture. I also toasted the walnuts, which you should totally do no matter what kind of nuts you use. For New Year’s, just use whatever nuts and dried fruit you have left over. I’d say the parsley should stay, but also add some fresh basil if you have it. You might even experiment with the marmalade; I dare you to use the last of your holiday pepper jelly! In a skillet over medium-low heat, toast the nuts until just fragrant, stirring every so often so they don’t burn. Remove from the heat and set aside to cool. In a medium saucepan, combine the rice, butter, oil and water or chicken broth and bring to a boil, cover and reduce heat to low. Cook until the rice is done (white rice should take 15-20 minutes, brown rice or wild rice blend closer to an hour). While the rice is cooking, prepare the parsley and basil and combine them in a small bowl in the fridge. When the rice is done, turn it out onto a sheet pan and spread it out to cool slightly. This helps the rice maintain its structure and not get smashed when mixed with the other items. When still just a bit warm, gently mix the rice in a large bowl with the marmalade and cranberries or other fruit. Just before serving, fold in the parsley, basil and nuts. Every year, my mom buys a ham for our traditional Christmas Eve dinner at her house. Every year, I ask the same question: Is it bone-in? Because I know, if it is, she’ll be making something like this come New Year’s Eve. I make it at my house, too…Good luck all around! Since Mom kept the bone this year, mine won’t have the (cover your ears, vegans) unctuous, gelatinous awesome that comes from a long simmer with the porcine hip bone. But even with the ham scraps alone, this makes for a festive and relatively easy dish to ring in the year. The night before cooking, pick through the peas for rocks and such (I honestly very rarely do this, but they say you should…meh) and rinse in a colander. Place in a large bowl and cover with fresh water, and cover with a towel or plastic wrap. Let the peas soak overnight. On cooking day, rinse the peas again in the colander to remove all the toxins that come out during soaking. In a large skillet, cook the bacon until crisp. 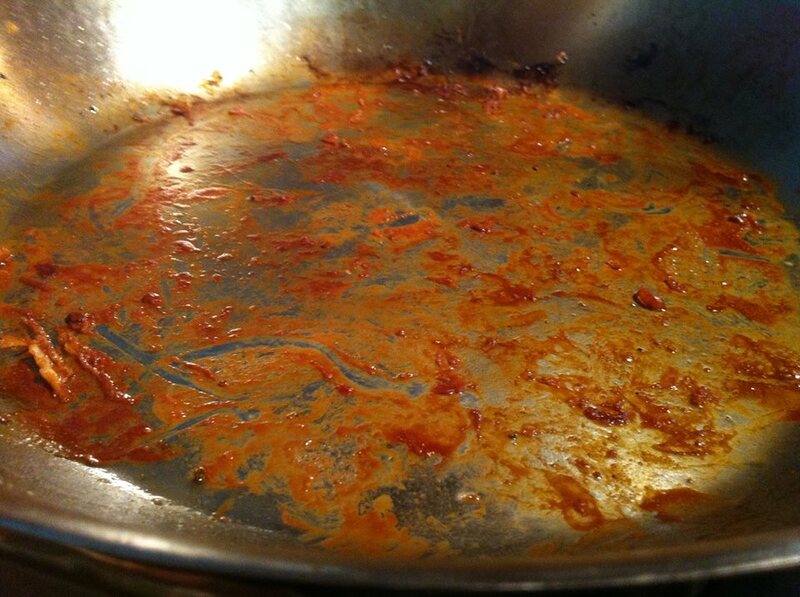 Remove the bacon to a separate bowl and drain all but a couple tablespoons of the grease. Add the butter, onion, garlic and celery and cook over medium heat a few minutes until softened. When the peas are tender to your liking, remove the bone and bay leaves. Smash about 1/4 cup of the peas against the side of the pot, or use an immersion blender (being careful not to puree too much) to thicken the liquid a bit. Season to taste with salt, pepper and a bit of hot sauce. Garnish with the reserved cooked bacon. These peas are fabulous right away, but they’re even better after being cooled and reheated the next day. Gluten free, xantham gum free graham crackers. Greetings from our cozy cabin at Big Cedar Lodge near Branson, MO! We’re spending the week here for Thanksgiving. We got here at 5 p.m. Tuesday and I’ve already been cooking like they don’t sell food around here. But, I actually enjoy that, so taking the larger vehicle so we could sherpa a week’s worth of groceries was totally worth it. 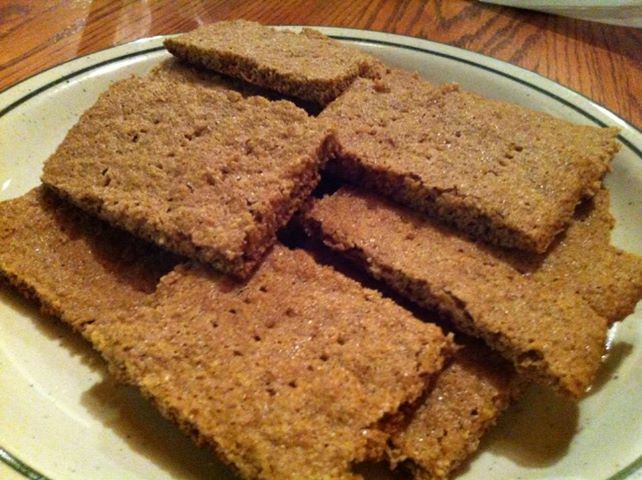 Tomorrow, I’ll get started on all the traditional Thanksgiving fare, but first, I thought I’d share one thing I’ve already made here at the cabin: some gluten-free, xanthan gum-free graham crackers. 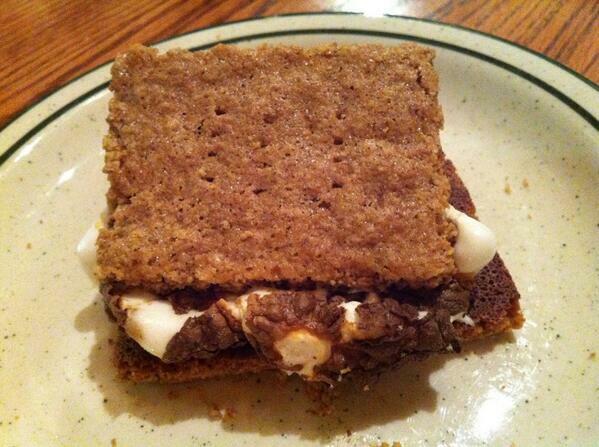 S’mores made from my very own GF graham crackers! See? Yeah. I’m pretty proud of these, actually. The family got right to work after dinner on s’mores, and I had planned ahead just enough to bring stuff to make my own crackers. If I had planned even more, I would have made them at home and brought them…but no matter. 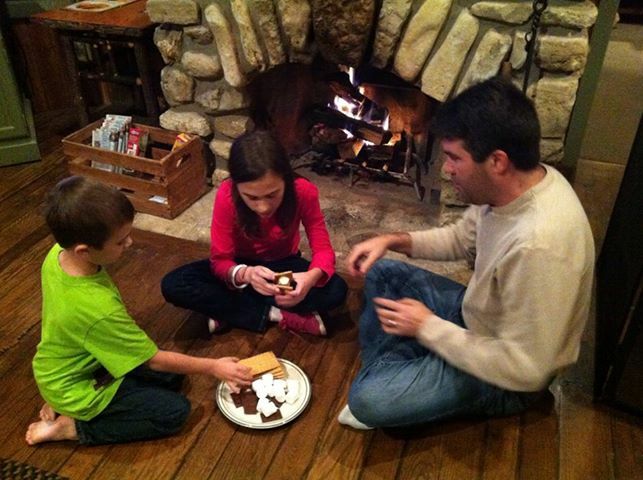 The family making s’mores by the fire. How could I not participate? I used this recipe from Living Low Carb One Day at a Time, although I used real brown sugar rather than her healthier alternatives. (Hey, one step at a time, right?) Kudos to Karen over there for the great recipe. I worried about the batter being really wet, but it worked out just fine. Just trust her when she says to roll it out between sheets of parchment. Silpats would probably be even better. But, I’m at a cabin, so we use what we brought, which remarkably included parchment. Tomorrow I’ll be on full Thanksgiving alert, working on the turkey, dressing, pies and such. Oh, yeah, and the hubs wants to take the kids to see Santa at Bass Pro Shops in Springfield. I’ll see if we can work that in. 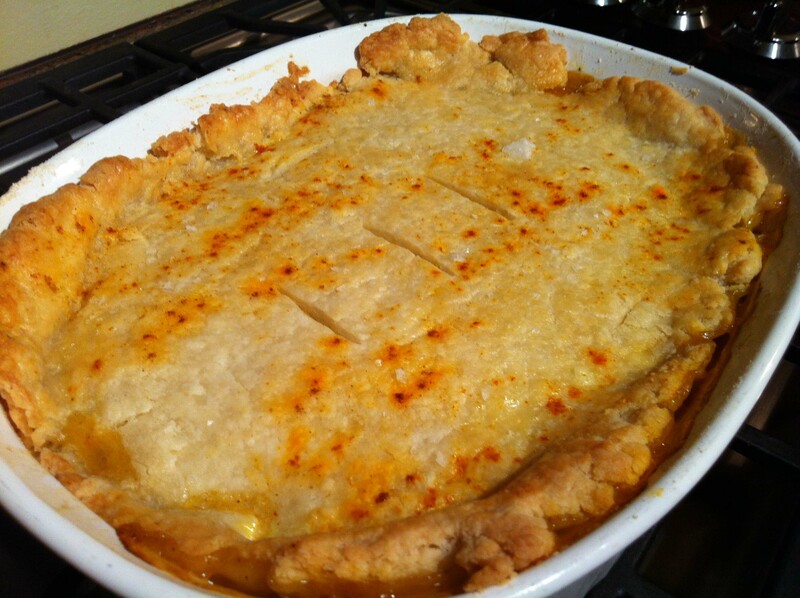 Speaking of pies, didn’t I promise pie crust in the title of this post? Ah, yes, I did. If you like a graham cracker crust, just use the above cracker recipe and crumble them up using your favorite crust recipe. Here are one or two crust recipes for you. If you like a more traditional pastry-style crust, here’s the recipe I made ahead and froze into disks for the trip. The dough actually behaves better after being frozen, or at least parking in the fridge for a few hours. If freezing, take it out of the freezer about 30 minutes before using. Place the flour blend, salt, butter and lard or margarine into a food processor and pulse (er, I had to run mine a while) until it’s a crumbly meal. If you don’t have a food processor, you can do this with a pastry cutter. Just cut the butter and flour together. Drizzle in the cold water a bit at a time, pulsing the processor (or your fingers, as the case may be) until the dough comes together. You don’t have to use all the water, just enough to bring it together. When it just comes together when you press it, it’s done. Turn the dough out onto a clean surface. It will still be a bit crumbly, and that’s okay. Divide the dough in two and form each portion into a disk, pressing slightly to help it come together. Place each disk into a freezer bag and place in the freezer until about an hour before you need it. Thaw and roll out on a GF-floured surface. If it comes apart, don’t freak — just use a spatula to pick up pieces as flatly as possible and press them together in your pie pan. Comes out exactly like the traditional pie crust you always knew. This recipe, if you can call it that, was part of the recent ‘Tis the Season event at Central Baptist Church in North Little Rock. I shared some appetizer ideas for holiday entertaining, along with some crazy stories and examples of ways to share love with people through food. If you were there, the ganache recipe is here (well, roughly…I’ll update soon with the exact one we made), and the bacon-wrapped dates from my friend Delta Moxie are in this issue of Farm Bureau’s Front Porch magazine. Tapenade, if you’re new to the stuff, is a lovely, briny olive mixture that can be a gorgeous and easy appetizer for holiday entertaining. I’ve mentioned it before, but this one is different. And actually yummier. It’s great on little toasted rounds of bread, rice crackers (they don’t get soggy), or just about anything, really. This is the fairly-fancy-but-no-time-to-waste version. It does require a food processor, at least for the super-fast version, although you could definitely use a knife or even one of those slap-chop kinda things if that’s your speed. The recipe is also born of inspiration based on a super-crazy week, which I’m sure I’ll see again come Christmas entertaining time. The crazy, that is. The inspiration will have to carry over. You may have figured out by now that I am a huge Kroger fan. They don’t pay me to say that (although, to borrow a phrase from Alton Brown, they could if they wanted to); it’s just true. One store in particular here in North Little Rock is my happy place: the Indian Hills store on JFK Boulevard. (Cue angels singing.) I shop there like most ladies shop for shoes at the mall, or wherever it is that trendy ladies shop for shoes. Tapenade in process, armed only with containers from the olive bar and a food processor. 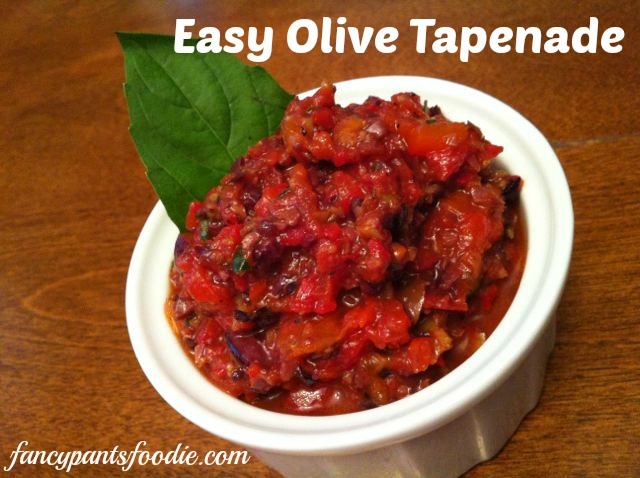 If you live near this Kroger, or any store with a similar olive bar, here are the steps to an amazing, multi-tasking tapenade that will wow any party. Pick up one large container (the biggest of the three), one medium, and two of the smallest ones, which are about a quarter of the size of the big one. Fill the largest container with the roasted red bell peppers from the bar. If you don’t see any, ask the attendant or someone at the deli and he/she will probably be glad to open a container for you. (At my store, she even offered to open one just so I’d have the very freshest, although the ones on the bar were perfectly fine.) 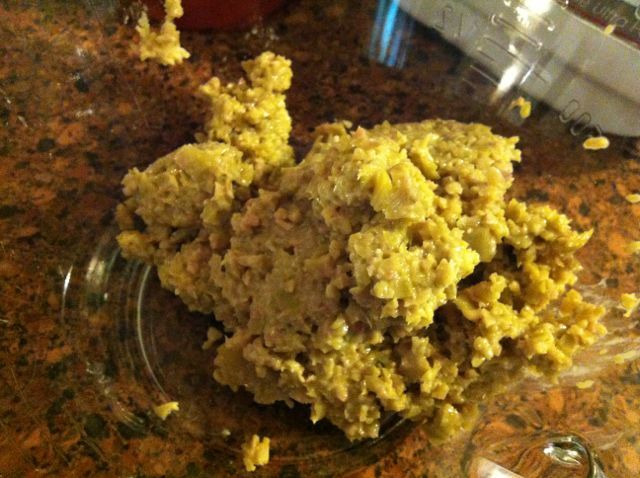 Avoid getting large amounts of the packing oil in the container. Fill the medium container with pitted kalamata olives. They’re the purple ones. Drain out as much liquid as possible. 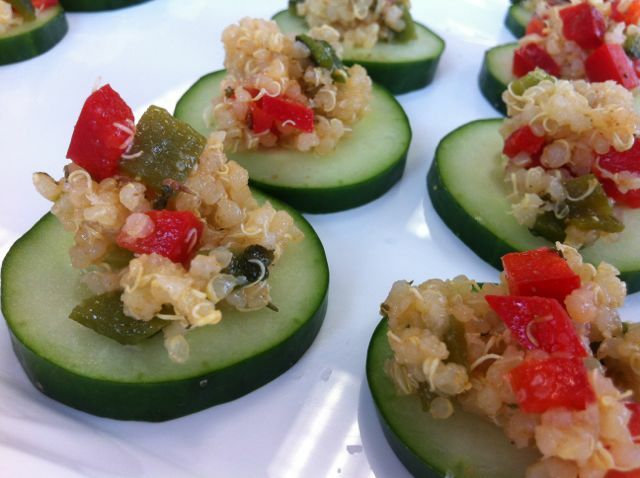 Fill a small container with green olives stuffed with garlic. This will save you the step of peeling garlic later. Bonus! And yes, avoid the liquid. You don’t want to have to pay for that. 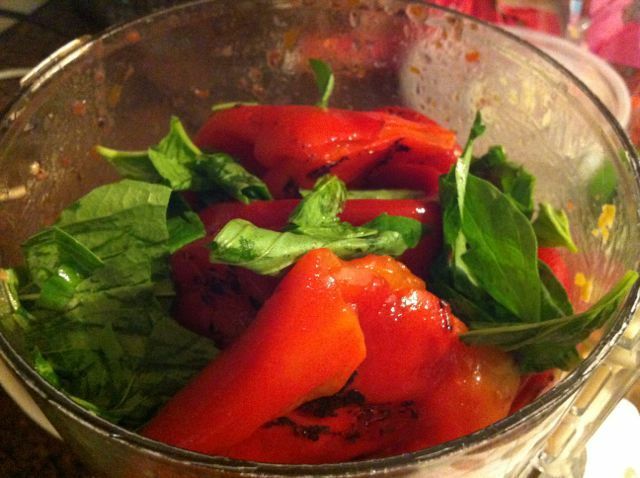 Fill another small one with sun-dried or roasted tomatoes. They are packed in olive oil, which you should mostly drain off. 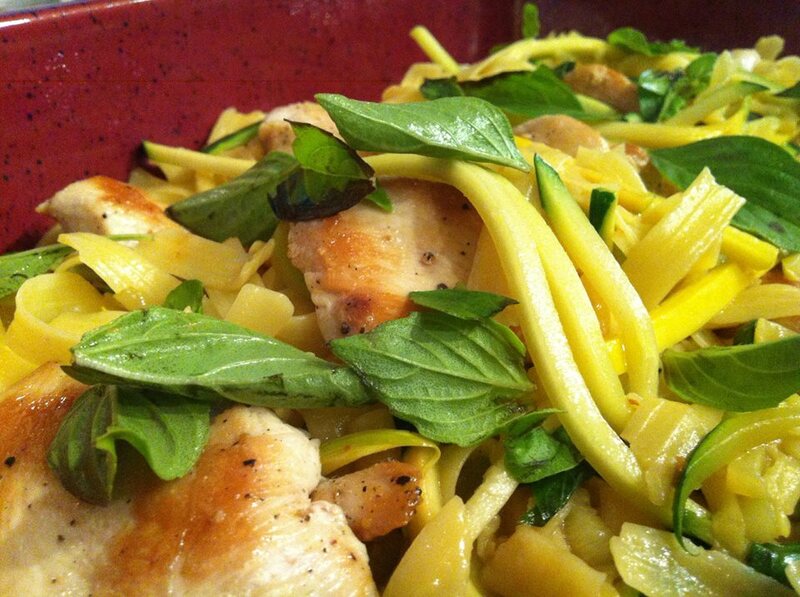 Run by the produce section and get a container of Simple Truth organic fresh basil. (I’m digging on this new Kroger brand of additive-free foods.) They’re in little plastic packages, usually hanging above the mushrooms and baby potatoes and such. The green olives stuffed with garlic, now a lovely nearly-paste with minimal effort. 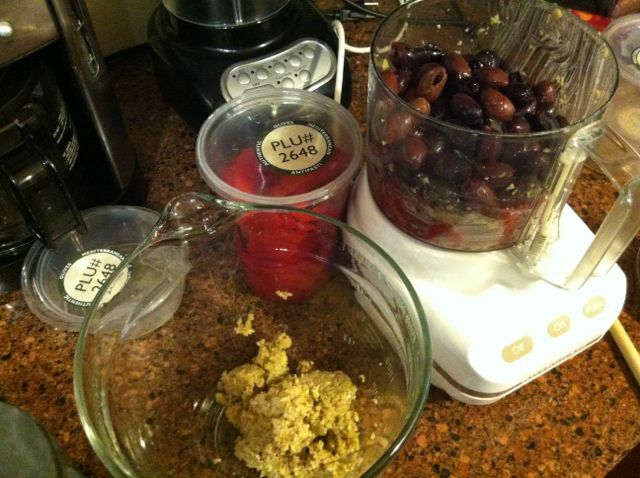 Back home, put the green olives with garlic in the food processor first. This is because you want the garlic to be pretty fine. Nobody wants to bite down into that! Buzz the green olives and garlic until they are teeny, almost a paste. Remove into a large bowl but don’t worry about the processor being completely clean yet. Put a handful of basil in the last batch of stuff you process. Now, put the other ingredients in the processor and buzz them until they’re in tiny pieces. Work in batches depending on the size and power of your machine; it’s all going the same place, so no matter. 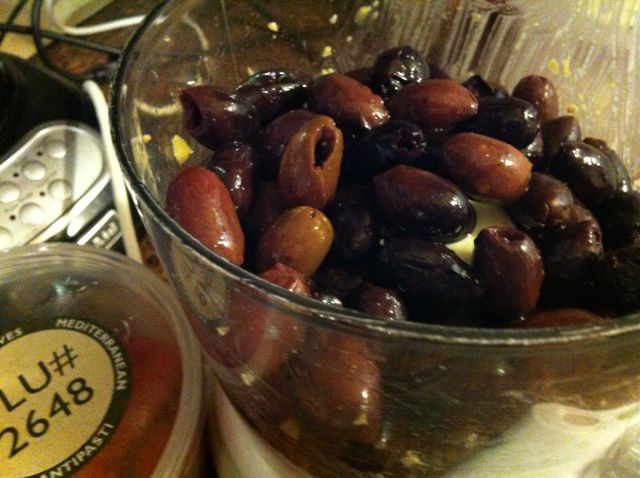 As you finish each batch, just dump everything into the same large bowl that already has the green olives and garlic. Add a handful of basil to the last batch you process and let it get minced along with everything else. Stir it all together. Kalamata olives about to get the grind. What, no olive oil? No extra salt? Nope. The oil that the peppers and tomatoes were packed in is plenty. And you can surely add salt if you like, but the olives are super salty, so try the finished product first. This is best the day after it’s made, so put that bowl in the fridge and let it get happy the day before your party. The next day, drain off any excess liquid, stir, and put it in a pretty bowl. Garnish with a bit of fresh basil. Boom. In our class, we sliced a baguette, brushed the slices with olive oil and toasted them in the oven before topping with the tapenade. To make things even easier, buy a container of rice crackers (in the Asian section of this particular Kroger) and call it done. They hold up beautifully under toppings, and your gluten-free friends (like myself) can enjoy them. And isn’t that what food is about, sharing love with all your people? I think so. I hope your people love it. This “recipe” makes a metric ton of tapenade, like enough for 20+ folks. So, if you don’t need that much, just get the ingredients in similar proportions. (I know, gag, math.) Four parts peppers, two parts kalamata olives, one part green olives with garlic, one part tomatoes. If you liked the container method of measurement, this could be one medium container of peppers, one small container kalamata, and one shared small container of green olives/garlic and tomatoes. You may want a metric ton. I’m just saying. Up next…an amazing pasta recipe that uses the remaining tapenade, should you have made a metric ton and have a bunch left after your party. Actually, it’s good enough to make the stuff for. 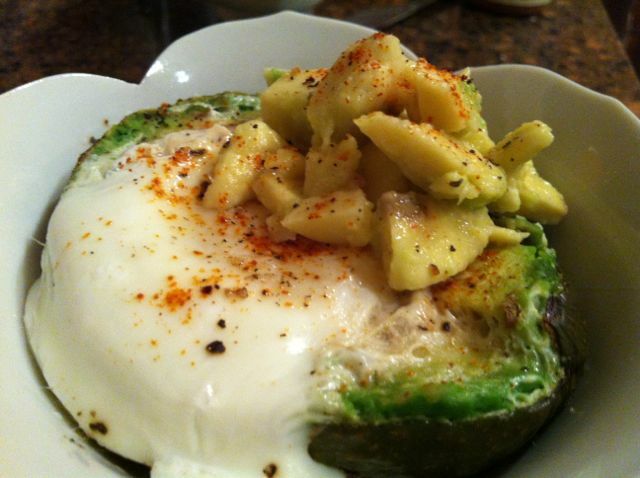 Finished product: egg microwaved in an avocado. With plenty of salt, pepper and cayenne. And more avocado. 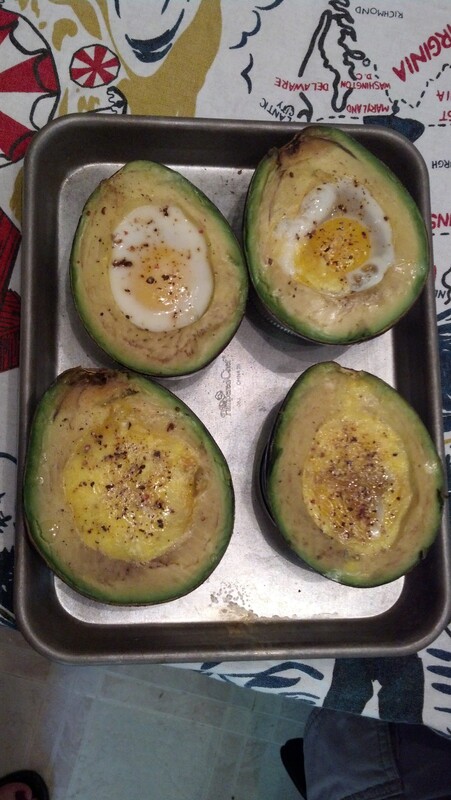 If you’ve looked at any big food websites or daily cooking shows like The Chew lately, you’ve heard all the hubbub about eggs baked in avocados. I had to find out for myself. Looking for a quick lunch before jetting over to the kiddo’s book fair this afternoon (goodbye, $$), I decided to try it out. Bonus: Breakfast for lunch! Cut an avocado in half (for the unwashed: run the knife around the seed, twist, separate. Jam knife into seed, twist, remove. Try not to cut your fingers off while removing seed from knife). Scoop out a hole a little bigger than the one left by the seed. Dump a raw egg into it. While constructing my ova-over-avo delight, I quickly discovered there were some tips that the other guys were leaving off. So, in an effort of public service, I give you these tips for making your own avocadian (avocadish?) masterpiece. 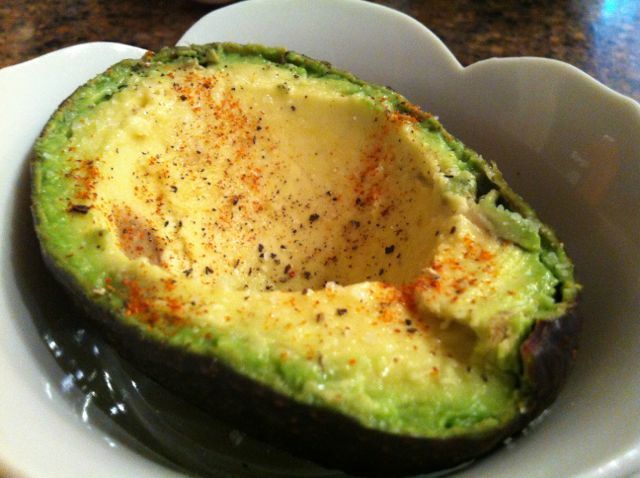 Put the avocado into a small oven-safe (or microwave-safe, whichever you are doing) bowl. My little flower-shaped ramekins were perfect. This helps minimize the mess of egg overflow, which is inevitable. 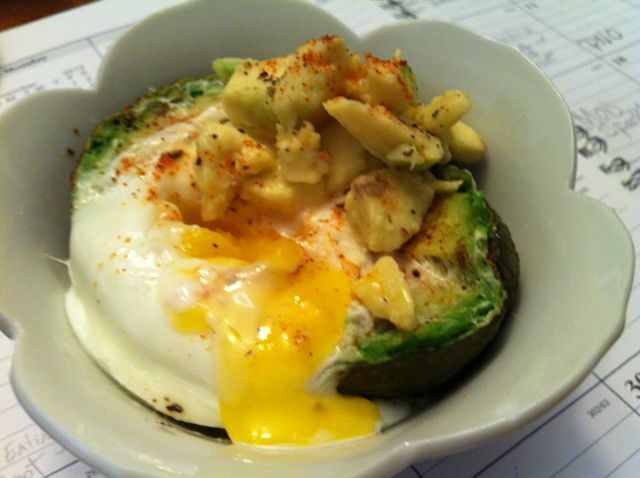 Use a ramekin to season the egg and to pour it into the avocado. 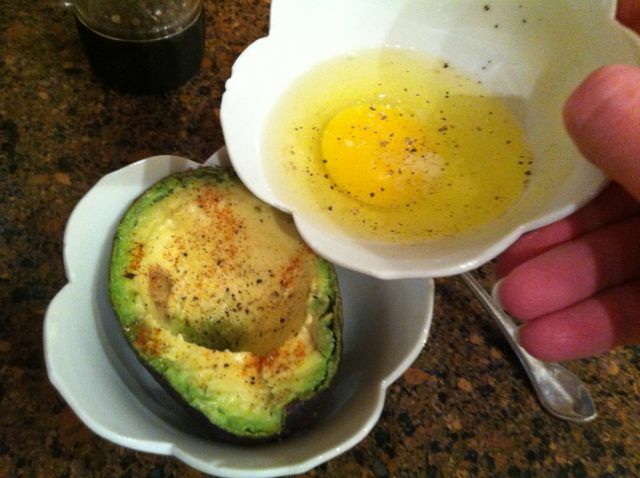 When cracking the egg, put it into a small prep bowl before dumping into the avocado. Season the raw egg a bit with salt, pepper and maybe a bit of cayenne. THEN carefully dump it into the waiting avocado. This also helps with aim, minimizing the inevitable mess (see above). Use the bit of avocado you scooped out as garnish. 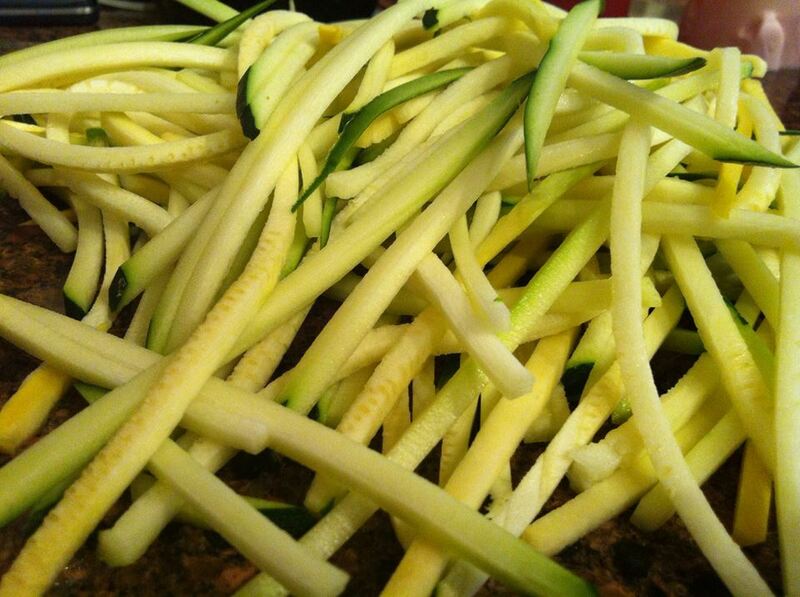 Cut it up (no need to be overly fancy; I just did it with my butter knife) and sprinkle on some lime or lemon juice. Or, make a tiny little bit of guacamole. Either way, keep it in a little bowl until you’re ready for it. 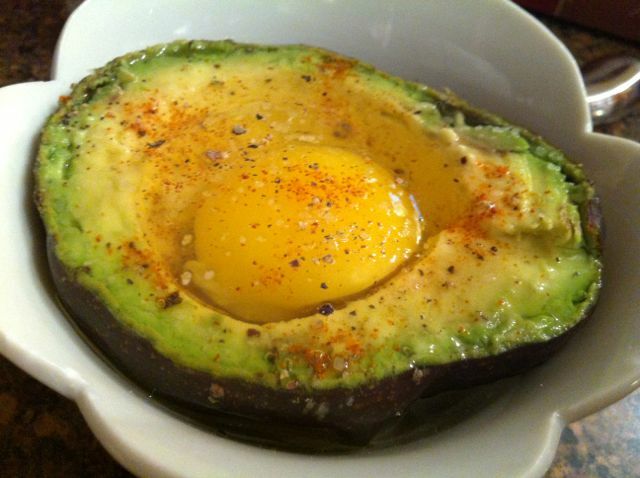 Seasoned egg and avocado, ready for the microwave. I discovered that, in the microwave, the avocado acts as a bit of an insulator. Usually I can cook an egg in 30 seconds to a minute, but this one took a full minute and 30 seconds. This cooked all the whites but a tiny, glistening layer on top that cooked with carry-over heat within a minute, and it left the yolk just a tiny bit runny. Your microwave may be different than mine, so check it at 30 second intervals. Spice and pork are your friends. I generally don’t eat a lot of pork, but of course, bacon. Thing is, I just used up the last bit of it with my numerous potato hash things I’ve been making lately. So, I seasoned the whole thing with plenty of cayenne for some color and kick. If I’d had a tomato or some salsa (left it at my mom’s…sigh), that would have been lovely, too. Mmmmm….a working lunch on my way out the door. UPDATE: Here’s a reader image from Katrina (see comments below). She made two with the whole egg and two scrambled and liked the latter better. Your turn!